← it’s much easier to find a full time job if you are already working somewhere and have experience and good references. What sort of tools did you use for your reader’s advisory? What kind of academic resources did you demonstrate to patrons? Which databases are you familiar with? I would provide more details about the tools that you used in order to provide reference, outreach, programming services and your other job functions. For example, you listed “using social media” under your skills section. How did you use social media in relation to your job(s)? You also mentioned “database searching.” Again, it’s more useful to indicate which databases (or vendors) you’re most familiar with. Also, you don’t need to state that you have MS Office skills since most workplaces assume that. 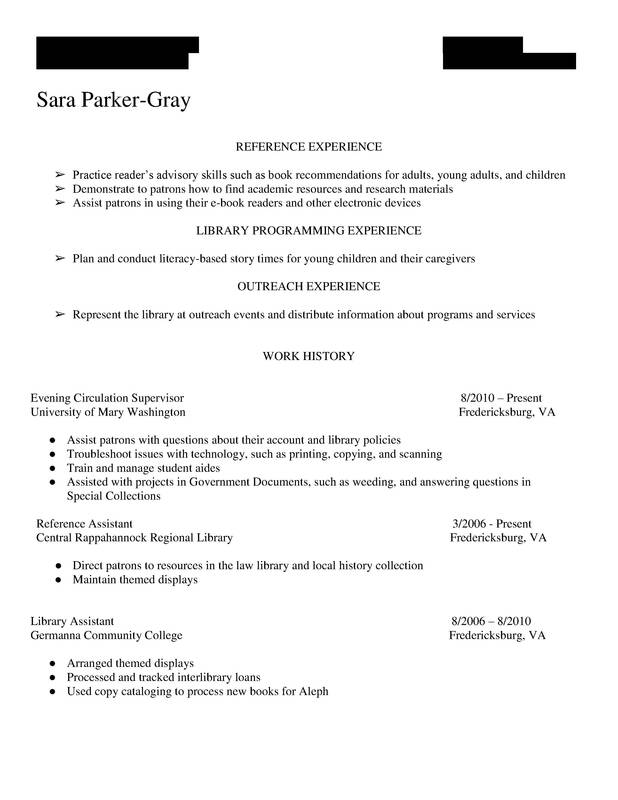 If I were a public library hiring manager, I would look for the “wow” factor. So far, I don’t think I can distinguish this candidate from hundreds of others with similar backgrounds. I think the candidate needs to list specific achievements and the impact of those achievements on her library and her patrons. In other words, the candidate’s resume should illustrate how the library and its community are better because of her presence. Otherwise, the candidate’s resume ends up being a very mundane list of job duties. I would suggest streamlining the format – incorporate the information re experience and skills back into your professional experience paragraphs/bullet points. Design your resume so that it speaks to the job ad in question – what are the qualifications set out in the ad? Move your education to the top/front – show that you have received your MLIS. Next list your professional experience. Since you will be applying for a reference position, I would list your reference experience first and then the circulation experience. Both are relevant and both are current positions. Regarding reference – what type of interactions have you had with library users – have you conducted reference interviews, instructed users in use of the local library catalog, assisted users locate reading materials that match their interests? Your interactions with library users – have occurred at both the reference desk and the circulation desk – highlight the experience. Move special projects information up on the list and tasks such as troubleshooting (technical) issues with printers, etc. to the bottom of the list. Reference skills and interactions with library users should be emphasized. As a supervisor, you have also had experience dealing with all types of situations, resolving issues so that the library users’ needs are met in a timely and friendly manner. Best of luck with your search! It’s a bit hard to distinguish between sections and entries. You might want to consider using a bolder typeface to mark the beginning of each entry. Times New Roman is so ubiquitous as to be utterly unremarkable, so you may want to consider using a slightly different font. Nothing outlandish, but something just different enough to stand out. Also, the actual entries seem a bit sparse. Flesh out your job descriptions a bit. don’t just tell me what you DID; tell me what you ACCOMPLISHED. Lastly, there seems to be an awful lot of white space; you might want to take a few minutes to tweak the line spacing. All in all, it looks like a really good start. I especially like the experience sections at the top. That seems like a very direct and concise way to summarize your relevant experience, and it seems like you have a lot. I wish you the best of luck in your job search. I would never have guessed that you had eight years of experience from this resume. I agree with other commenters that you need to be more detailed in your job entries about what you did and more specific with your tool skills. You’re a librarian- I assume you can search a database and use office. I’m not sure how I feel about your experience being at the top. I think it feels a little off to me, but I can’t give a good reason why. I think as someone who has gone through many resumes, I sort of expect to see those details below jobs and seeing them there sort of stranded makes me confused as to when you did these things and where you were working when you did them. On the other hand, after going through eighty resumes I might be grateful to have them at a glance. I can’t decide. I would keep your education after your work experience. You have eight years of work experience in libraries, unless you JUST got your MLS, we’re going to assume you have one. 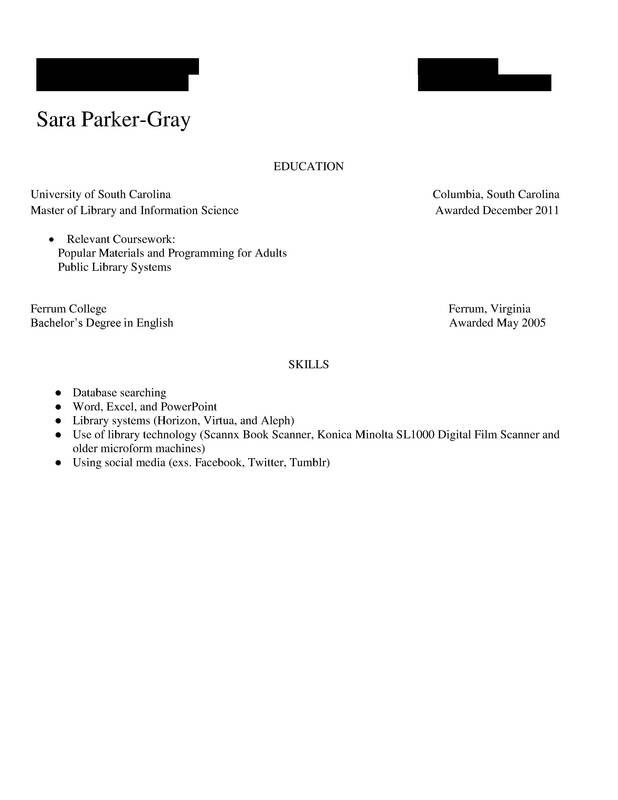 I would try to compact the resume to one page or make it a full two pages. As it is, it feels cut off at the end. I also agree with others who have suggested come more dynamic formatting. Perhaps a font change – nothing to radical- but something more interesting and using italics and bold to your advantage. I would recommend printing out your resume and holding it at arms lenght away from you. Ignore the words and just look at how it falls on the page. It should feel full, but not crowded and professional. Surprised to see the MLIS on the 2nd page – if I were reading this I’m not sure I would have gotten this far. Agree with other commentators that I wouldn’t think this resume spoke to 8 years of experience… I would like to see you elaborate on the tasks and fill two pages, or reduce it all to one page. your job chances is by using stronger language that more clearly describes the work that you’ve conducted and demonstrates your hard and soft skills. For example, you have experience “direct[ing] patrons to resources in the law library and local history collections.” Because you conducted this work and drafted this résumé, you may be surprised that this statement is actually unclear. Did you physically direct the patrons to resources by navigating them to and through the stacks, or did you facilitate their ability to find materials by conducting reference interviews and showing them how to use the library’s catalogue? In another instance, you state your experience working on “projects in Government Documents, such as weeding, and answering questions in Special Collections.” Again, this is rather unclear. Are Government Documents and Special Collections the same or different library units? Does Gov Docs have a special collection (lower case “s” and lower case “c”) in which you developed expertise in order to provide patron services? With the right language and a bit of clarity, your résumé could shine! Regarding the top matter – I agree that the varied experiences are a little confusing. Perhaps you might consider merging the three headers into one, general header and either using your existing bullet points or collapsing them into a brief paragraph. If you maintain this section, you might want to change the word “Experience” (which is typically used instead of “Work History”), as reviewers might not understand that you’re actually highlighting your accomplishments, skill sets, etc. If you do this, consider adding some major accomplishments, such as the length of time you’ve planned and conducted story times and the types and places in which you’ve done outreach.